As usual, things have been busy around here. There’s always some kind of work to be done on a farm, and it’s time to begin winterizing, so My Cowboy has lots of projects he’s itching to do. He gets really antsy because he wants them all done NOW, but his health requires him to pace himself, and some of them he needs help with — and I’m not much help these days, because . 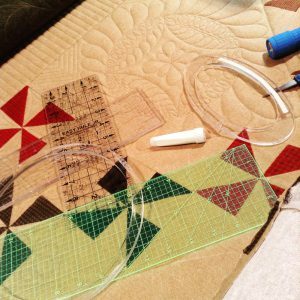 . . I’m too busy quilting. I do try to get in on the fun stuff, like this morning when I got to drag a feed bunk around the pasture with my truck; but it’s not all fun and games, like when I have to help hang gates, chase cows, and unload feed. My Cowboy gets lots of help from The Black Panthers, but it’s not exactly the kind of help he’s looking for . 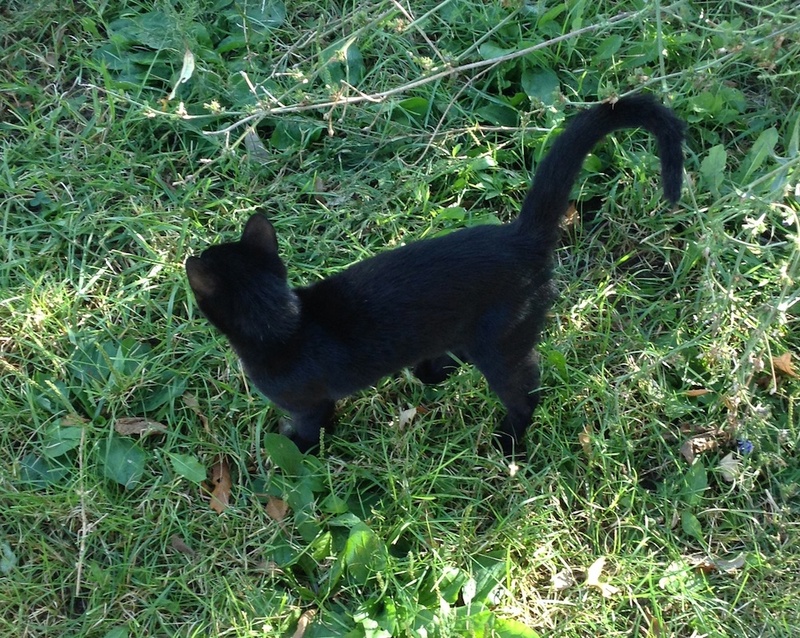 . .
Back in the spring, our friend, Joe, gave us three identical black kittens. They’re so identical, you can only tell one of them from the others, and even then, you have to look real close. 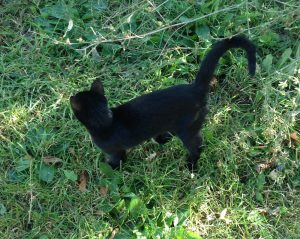 Since we can’t tell them apart, we haven’t really named them, and just refer to them collectively as The Black Panthers. Of all the cats we’ve had over the years, I don’t remember any of them being as funny as these three are — what a constant source of entertainment! 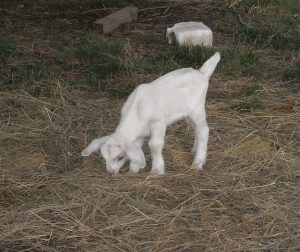 And you can’t go anywhere on this ranch without them tagging along. 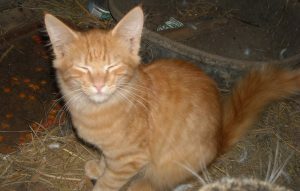 We also got another new kitty — Goldie. 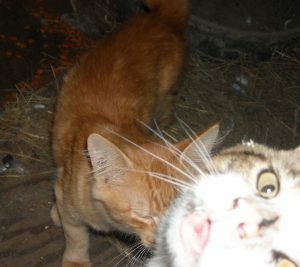 I couldn’t resist posting this photo of Felix photobombing! And here’s a few more of the highlights of the last few weeks around here . . . While I was gone on the cruise, poor Pepper gave birth to a stillborn baby, so sadly, Henry did not get a playmate this time. Pepper has recovered just fine, and she and Blossom keep trying to teach Henry how to jump up on top of the goat hut, but he’s just not big enough for that yet! Since then, he’s gotten us another three, so we’re up to seven guineas. 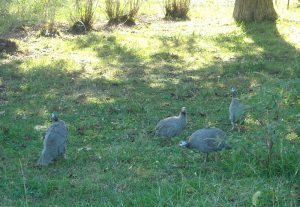 I love having them around for bug control, guard-guinea purposes, and also simply because I think they’re hilarious to watch. I hope they eat lots of spiders! I finished the binding 15 minutes before I handed it off to her as she was on her way out of state to go to the wedding! And I don’t think I made a formal announcement here, but I did make the announcement HERE, that I have a book coming out sometime soon! I’ve been scrambling to finish the manuscript, and can I just tell you what a relief it is to finally have that part done? Whew! And I did all that while I was sick with a bad chest cold. All I wanted to do was sleep, and I was actually getting very little sleep at all. I need to get better at scheduling! 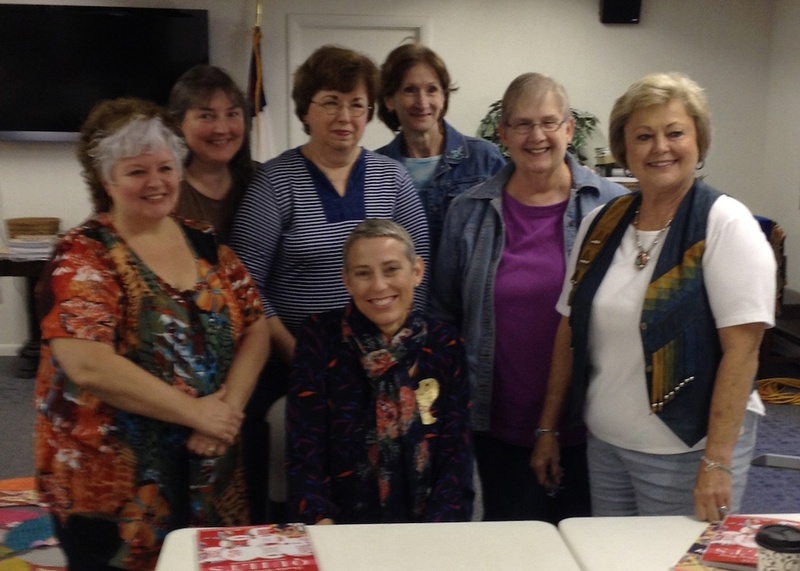 Almost immediately after we got home from the cruise, Victoria turned right around and flew to Missouri, to do a series of lectures and workshops at Missouri Star Quilt Company in Hamilton. My art quilt group decided to take a field trip to see her there and take her class. We didn’t tell her we were coming, and surprised her in her class. I think we shook her up a little and caught her off guard! But we had so much fun that day. 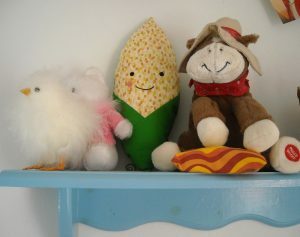 Victoria used her Sizzix dies to make a bunch of different stuffies, and I fell in love with the corn! 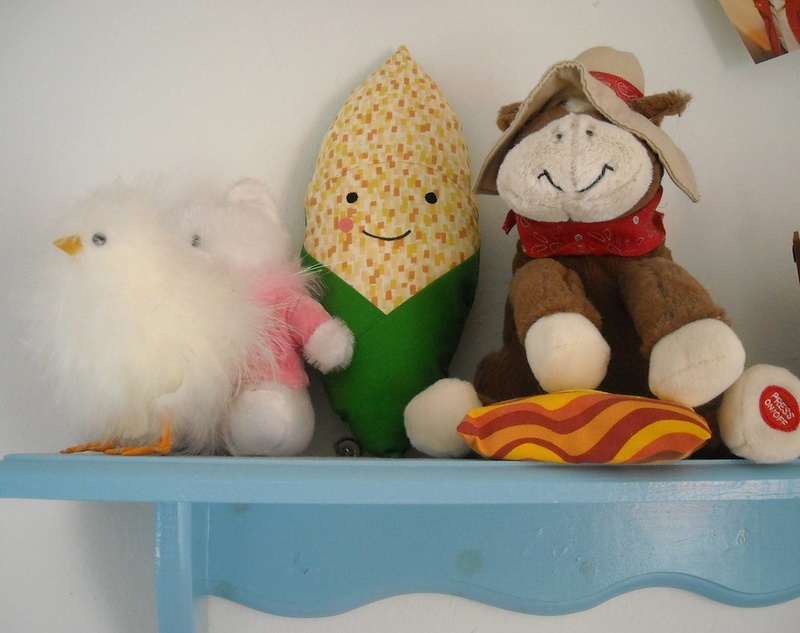 Victoria let the corn come home with me, and now it’s got a place of honor in my sewing room. 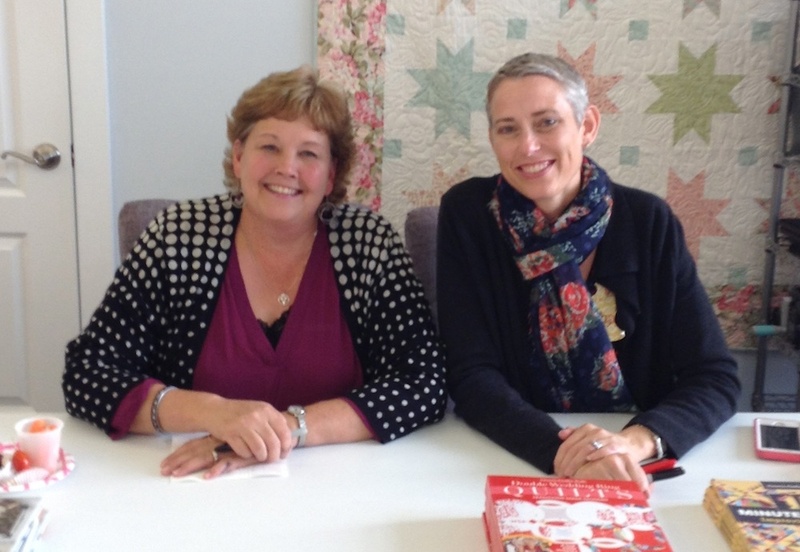 Victoria and Jenny Doan both did trunk shows that day — what a treat! They both signed books afterwards. I have two more days to meet a couple of deadlines, and enjoy fall here on the farm, before I head out to the trade show, Quilt Market, in Houston, Texas. I hope the fall weather sticks around a while, so I can have a few more chances to enjoy it while it’s here. I hope you all are having a wonderful fall as well! Well, you made what was an awful lot of work sound like a lot of fun. Nice writing!!! I hope you have a good time in Houston. Enjoyed the update! Whew, you are one busy gal who loves what she does! You go, girl!! Love those panthers! Multiple cats are more fun than a single cat. Great update! 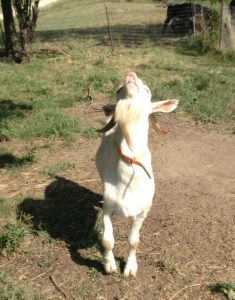 some familiar faces & some fun on the farm. Looking forward to your new book. Wow girl. When do you take a break? You are certainly busy. But busy hands get things done. Please let me/us know when your book is published. Oh my! I could not compete with you and your schedule. Seems like you and Victoria just got back from the cruise. Slow down and rest a spell. We want you healthy and happy. Love the little panthers! Congrats on the new book. Congrats on the book. I am excited to see it. I go to the doc today. I am hoping to get an idea of when I can train on stairs as my sewing room ( aka heaven) is up 13 steps!!! and it needs a cleaning!!! Oh, how I love the tick-eating power of guineas. Good Gravy Girl! I need a nap after reading all that and its not even 8 am! 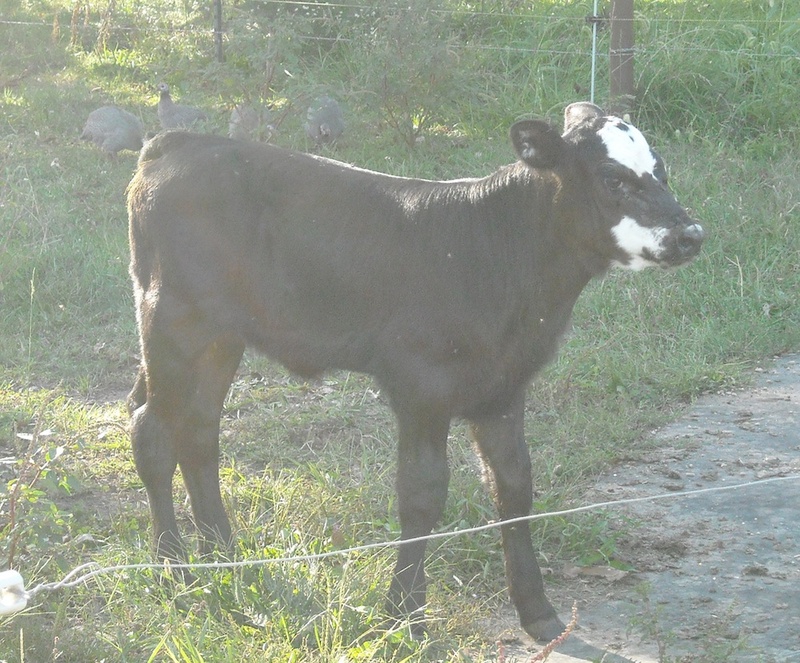 Looks like your farm family is growing by leaps and bounds! And a book?! How exciting! I’m so tickled for you! I’ve heard writing a book being compared to having a baby so I guess your family is growing in more ways than one! Congratulations!